Last week I spotted some gorgeous peaches at the market and – a bit on impulse – ended up buying a huge box of those beauties to bring home! 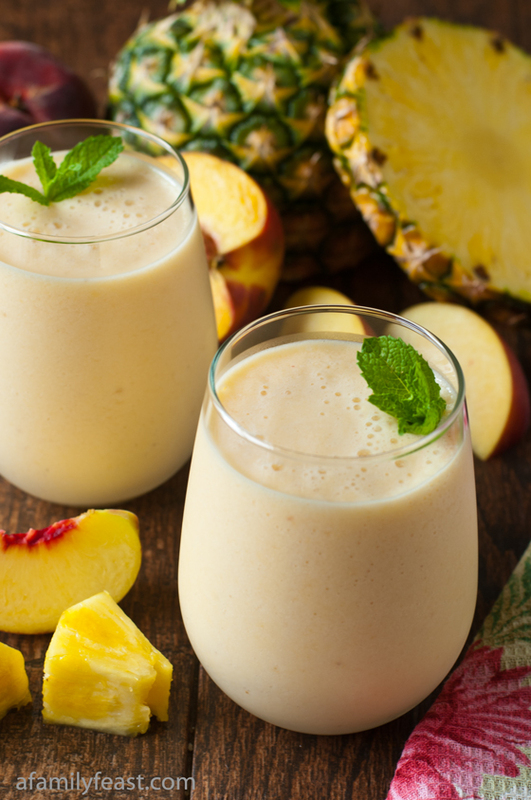 Peaches have been perfectly sweet this year – and we’ve been grilling and poaching them, as well as adding them to our favorite fresh peach smoothie recipe! 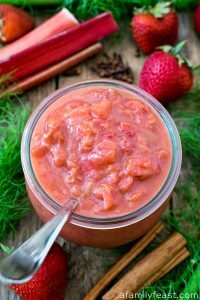 But all the while, I knew that I would be making a batch of this sweet and spicy Peach Butter so we could enjoy sweet summertime flavor long after peach season is over! This peach butter recipe is from the same farm that our popular apple crisp recipe was originally found, and it is very easy to make! Simply peel and pit the peaches before puréeing them in a food processor. Then sweeten the purée with granulated sugar and reduce the mixture on the stove until thickened. Once the purée is reduced, stir in some cinnamon, ginger and allspice – and let cool. 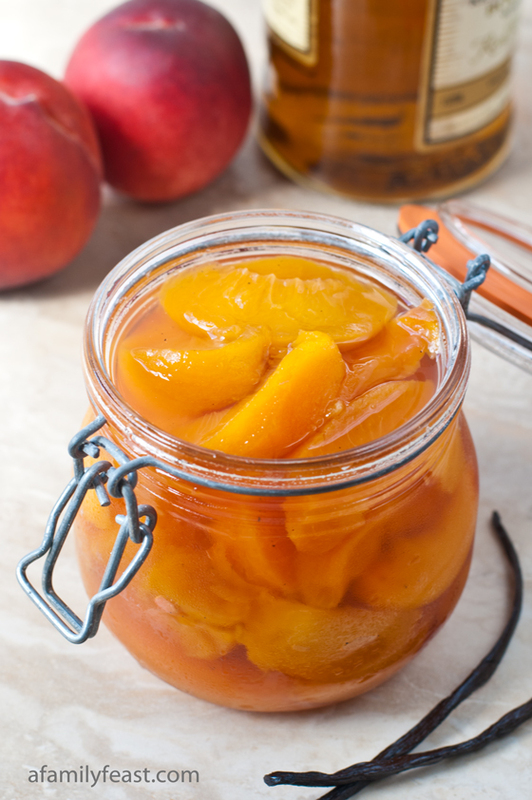 This recipe makes a good-sized batch of peach butter which can be canned in smaller jars. 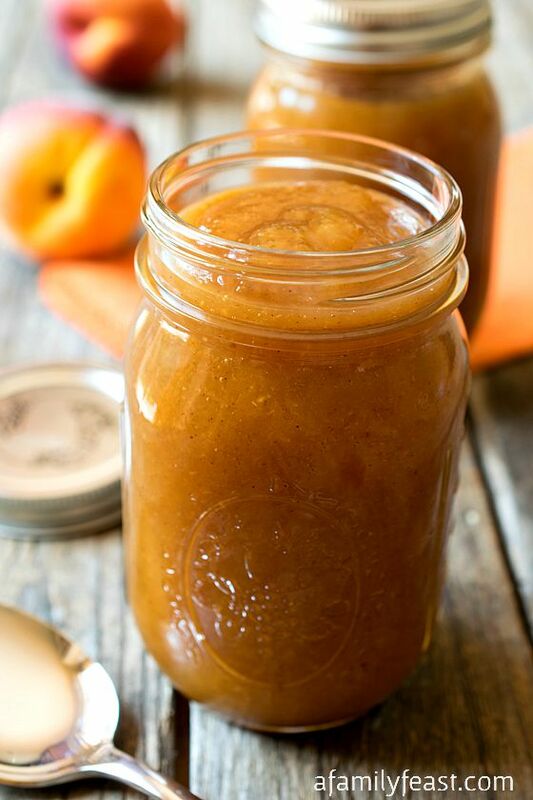 Then all year long, you can enjoy this peach butter over ice cream, spread on buttered toast, spooned over pork chops – or eaten straight out of the jar! Adapted from the Tougas Family Farm Cookbook which you can find online here. Peel and pit the peaches, then puree in a food processor. You’ll want a total of 8 cups (2 quarts) of peach puree. Pour puree into a large, heavy bottomed pot and add sugar. Over medium heat, bring peach mixture to a boil, stirring frequently to prevent sticking and scorching. Boil until the mixture is thickened and reduced by about one third (again, stirring to prevent sticking and scorching) – for us this took about 20-25 minutes. Remove the thickened puree from the heat and stir in the spices, mixing evenly. 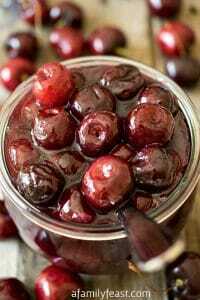 If canning, pour into clean, sterilized canning jars and process for 10 minutes using the water bath canning method. Any un-canned peach butter should be stored covered in the refrigerator for up to a week. This peach butter is fantastic!! I made it a few weeks ago and gave a jar to my sister and daughter. We all absolutely loved it. I will be making this again, for sure!! Thanks Polly! So glad you all enjoyed the recipe! Can you store the peach butter in the freezer (like freezer jelly)? Hi Sue – I can’t say for sure if freezing will work…We’ve only canned our peach butter. Sorry I don’t have more advice for you! Mmmm. Love the fresh peach flavor with the warmth of allspice. Now I have to go to the market and get myself some peaches! Half the farmer’s market was flooded with peaches this week. If I didn’t already have a bag sitting at home, I would have bought more. I should have, this peach butter looks amazing! Yum! I haven’t made peach butter in years. 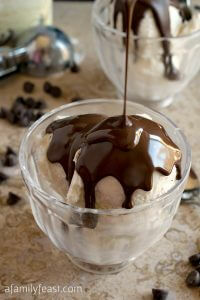 Now would be a great time to make a batch using your delicious recipe! 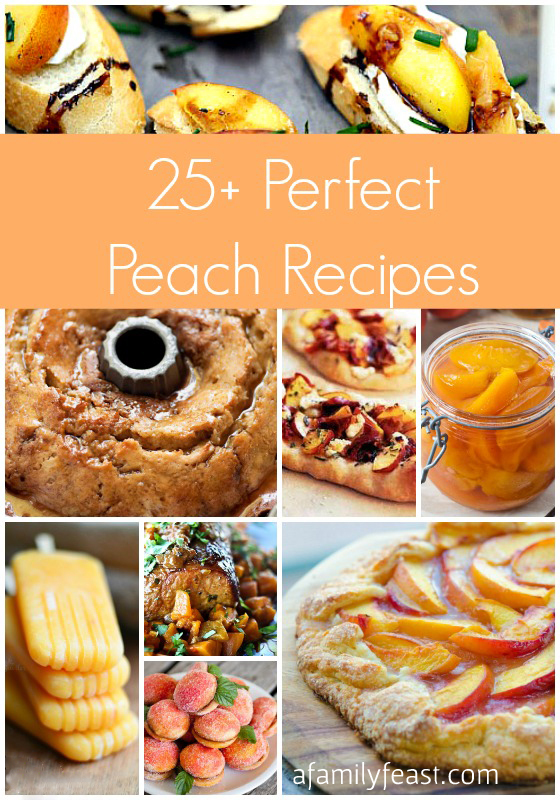 I love peach recipes, and this peach butter looks fantastic. can’t wait to try it! 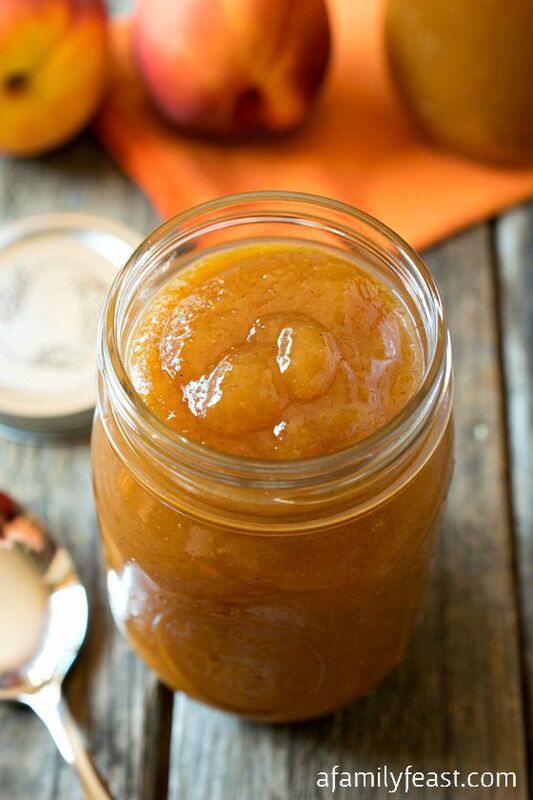 We love apple butter so I know we’d love peach butter. Brilliant. 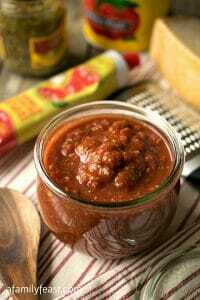 I love the ingredients in this peach butter, especially all of the spices! Yummo! I also made something similar (with bourbon) last week for chicken burgers…so good! 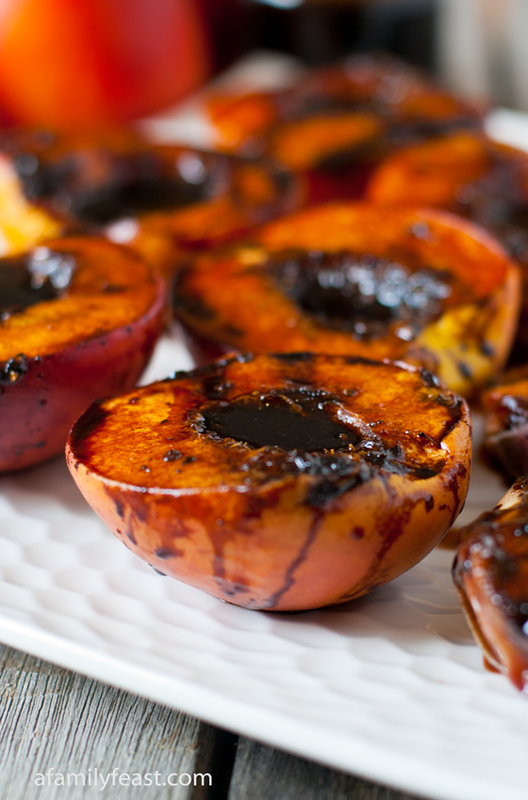 Your Grilled Balsamic Peaches are stunning! I HAVE to make them! 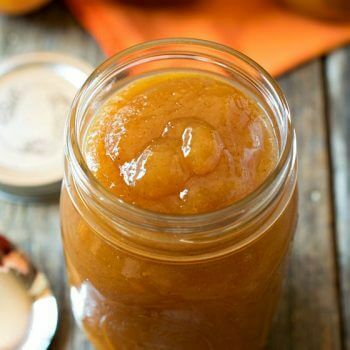 Could I freeze this yummy peach butter instead of canning? Hi Linda – I haven’t tried freezing it…but I think it would work!